← Surely she will die! So… the whole Edmonton thing. It’s not quite happening in the way I had imagined, though it is certainly proving to be quite the adventure and the delays and twists and turns are throwing me into meeting some lovely, interesting folks. It now looks like Lucy will almost certainly beat me to Calgary, short of the plane going on strike. Since I last wrote we have decided (Team L2L) that we are not going to predict when I might be anywhere as it is proving rather impossible to get anywhere near the correct answer. If only Edmonton was a comet, maybe it would be easier to reach! I have in fact been to Edmonton already this last week and with Hercules, too. But we didn’t pedal so it doesn’t count. After my last blog the snow fell to a soft and beautiful 8 inches the night before I left Grande Prairie, making for a rather tiring 15km walk pushing my 70kg Herculean steed through the unplughed snow to get out of town. 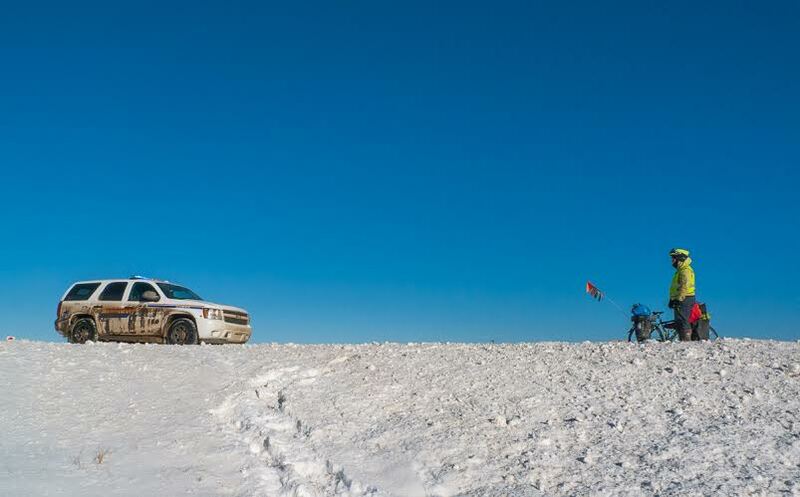 Having discovered Tim Horton’s recently, I paid my dues and inhaled half a dozen doughnuts before pushing on into the white and along the icy highway. The long and the short is that three days later I wasn’t very far down the road and so when a kindly truck driver stopped to take my photo, followed by a police officer stopping to take my details, I rode the 320km to Edmonton with Truck Driver Dave to pick up my winter spiked tyres. 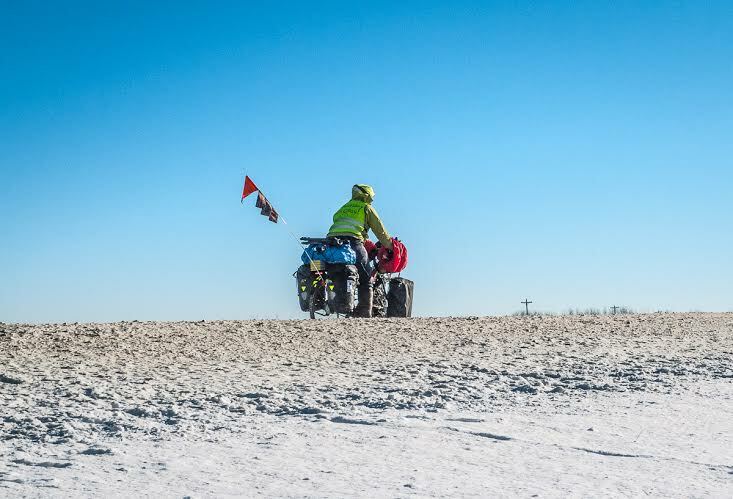 Talk about serendipity – Dave is a keen winter biker, so had lots of useful tips to share. I had a couple of days in Edmonton rifling through my pre-shipped boxes of winter gear, bought some pretty fancy and toasty warm cycling boots as my neoprene wellies were freezing solid in the -20 C temperatures and threatening frostbite, and chose a new winter tent for Lucy and me. 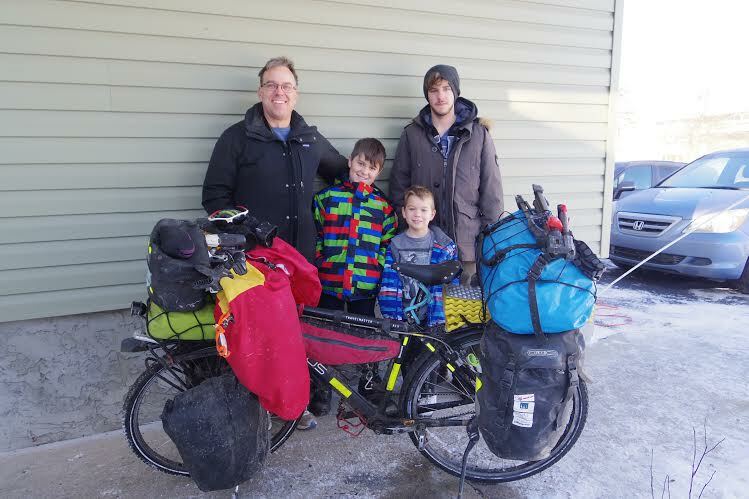 Yesterday’s riding to Whitecourt was made all the more fun by being joined by Ray, locally acknowledged as the ‘only winter biker around here’ on his fat bike (think motorbike sized tyres) and an overnight with his young family. One of his sons exclaimed this morning ‘It was great to meet you. Now I can say I had a celebrity sleep in my bed’. ‘Oh, no, I’m sorry’, I said. ‘Hercules was in the garage’. And Whitecourt is where Hercules and I have stayed again today, despite my best efforts to leave and on account of Hercules having a touch of man flu, scuppering my vision to ride through the night to Edmonton. Today he had his first two flats of this continent, courtesy of one of those cheeky bits of metal wire that lorry tyre blowouts leave on the road, a broken quick release as I replaced the wheel, and an issue with the brake caliper (might be the wrong word?) grating the wheel rim in a dangerous sort of fashion, irritating my ears and damaging the rim. And this was all before I had even managed to pedal us out of town! I am no mean bike mechanic but I do enjoy tinkering, and figuring out, something that works to get me on the road again. The grating-slowing effect of the brake system had me stumped for a wee while until a chap called Jeff stopped to help and took me back to his friends’ house, having seen me with Hercules upside down at the other end of town a few hours before. His pals Jason and son Terris jumped straight into action when we arrived, oohing and ahhing over the various novel bike parts, and I sat smiling at having three eager chaps working on Hercules. They are real wheel-nuts. Cars, bikes, engines – I could see they were in their element. Folks are super, super kind – this is not just my journey and never has been really. All of these people become a part of it, too. I just get to sit on the bike – there are so many people helping the wheels turn and get them going when things splutter to a stop. 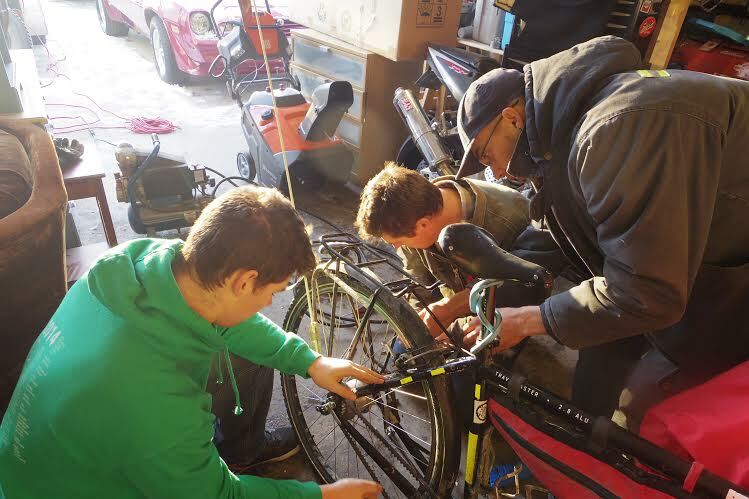 People – know that your cyclist is super grateful! inter cyclist Ray delivered a new quick-release spindle this morning to me, roadside, and insisted I take some of his extra inner tubes too, not being sure of how well tube repair would work at minus whatever. 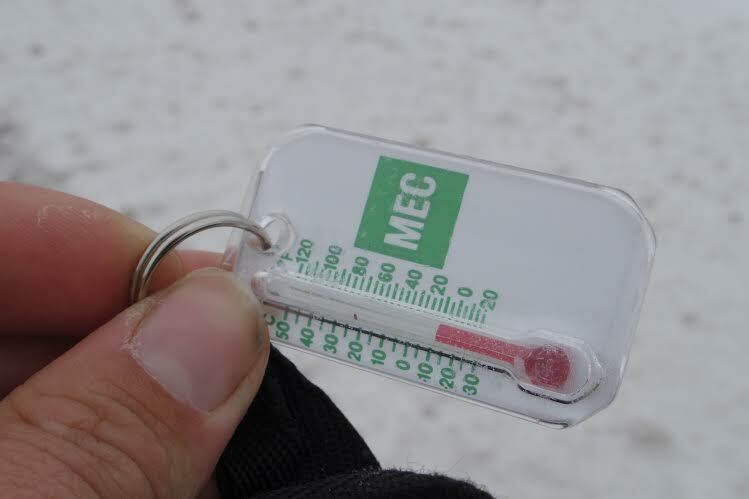 -15C quickly became -20C, Still a novelty! So I feel happily, cosily, looked after as I sit here cross-legged in front of a roaring wood stove in a lady’s house while she is out at a church meeting, having met her an hour before she left me alone in her house. Talk about trust, warmth and kindness. I am one very lucky lass. It is the story of the road – especially, it seems, now things are even chillier. Most people balk at the idea of me sleeping out, even though I have lots of warm clothing and a fluffy duvet of a sleeping bag. Meanwhile, my new winter 2-person tent sits patiently in my rack pack waiting for its first outing. It looks like it may wait until I reach Calgary and meet up with Lucy. Tomorrow Hercules and I wil ltry to ride again and, if the going is good, I aim to ride late into the night to reach Edmonton. (It is 180-something km away) But I am not getting my hopes up (or Hercules’) as this journey shows me time and time and time again, you just never can tell. And anyhow, the journey is the reward…. So glad to know people are stepping up to help you on your way. Hope somehow, somewhere I can do the same. As a Mom, I don’t want you sleeping out in this weather either! Great to hear that people are looking out for you, and that you’re keeping warm. We’re all thinking about you back here in Grande Prairie, and anxiously following your progress. 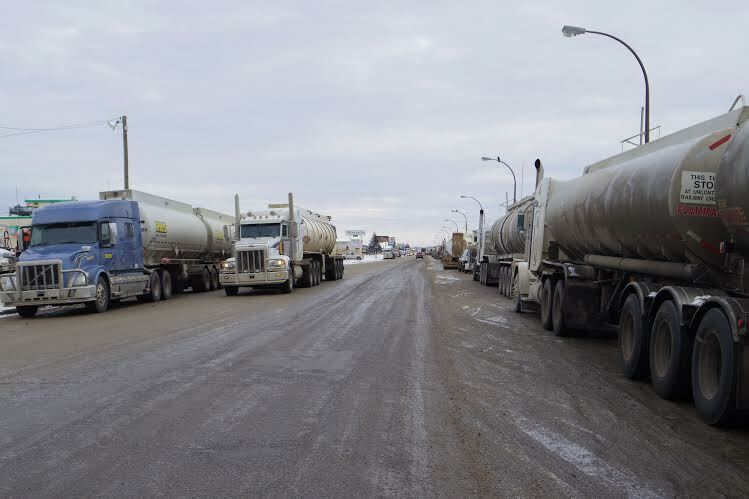 Wishing you clear riding to Edmonton and on to Calgary, where Lucy will, no doubt, be waiting. I sand Les Mis for the final run into town. Only a few odd looks. I had forgotten that your song has a naughty word in it! Does Alex know?! The land of the peace pilgrims. Happy Thanksgiving to you Sarah Outen! Steer clear of the trucks and always choose the indoors and a warm place to sleep over a tent and the darkness. Frostbite is seriously tragic and not worth the risk. Cheers! Indeed I have Jen. I have huge loyalty to Hercules and Santos/MSG the guys who sponsored me with him. So I shall only swap out if it becomes necessary if the snow is too deep at any point. The new spiked tyres are proving brilliant, so hopefully they will be sufficient. Oh, blush! Please tell Officer Tupper I rode over a creek and bridge named after him the other day. Hope all is well up in Sand Point and that Pavlof’s spouting isn’t causing too many troubles. 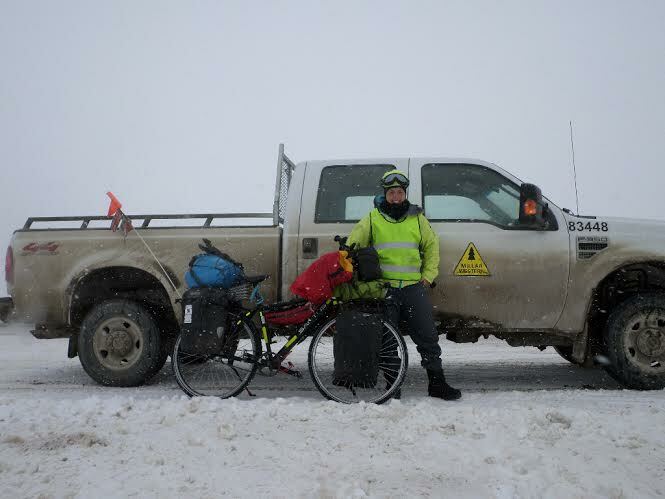 Hello folks………………….HUGE THANKS to ALL you wonderful folk out there who stop by, offer food and warmth and hospitality to my chilly daughter as she cycles across this vast continent called Canada!! I am so grateful for all the help and kindness already shown to her. It is reassuring to know that there are still kinds folks around. Thanks to you all. It’s wonderful to see how much progress you have made. Cycling on the snowy roads here is quite a challenge. Happy peddling. Thanks Justin. It just got a lot faster thanks to the new spikey tyres for Hercules. Yesterday’s ride to Edmonton was pretty clear, which was a treat. Glad to see you are still doing well! I hope the weather gets better! Folks! In the wee hours of Tuesday morning Hercules and I landed at our hosts’ in Edmonton, after a looooong day in the saddle. 190Km or there abouts. We ride again tomorrow, south to Calgary and Lucy! If you get a chance could you post detail of your kit list. Clothing/camping/bike spares/comms/navigatio/power supply. It is going to be a mild sunny day here in NE Scotland tomorrow for my weekly cycle ride. I will think of you as I cruise the quiet roads. No snow. Easy distance. No pack of stuff on bike. Nothing like your daily efforts but I wil still reward myself with cake afterwards. I hope the snow does not slow you too much. Keep on “pumpinn chain” ! Your an inspiration ! An Inspirer ! An Adventurer. I wasn’t going to go on a motorcycle tour out East this year but after reading your posts….. I am ! …….. Hope you are coming into Ontario ! Would love to meet you! We’ll give you a warm bowl of soup and a warm place to stay.